Every now and then, we crave a simple but sophisticated, no-muss, no-fuss restaurant that serves quintessential lunch fare—in short, a great spot to grab a bite. 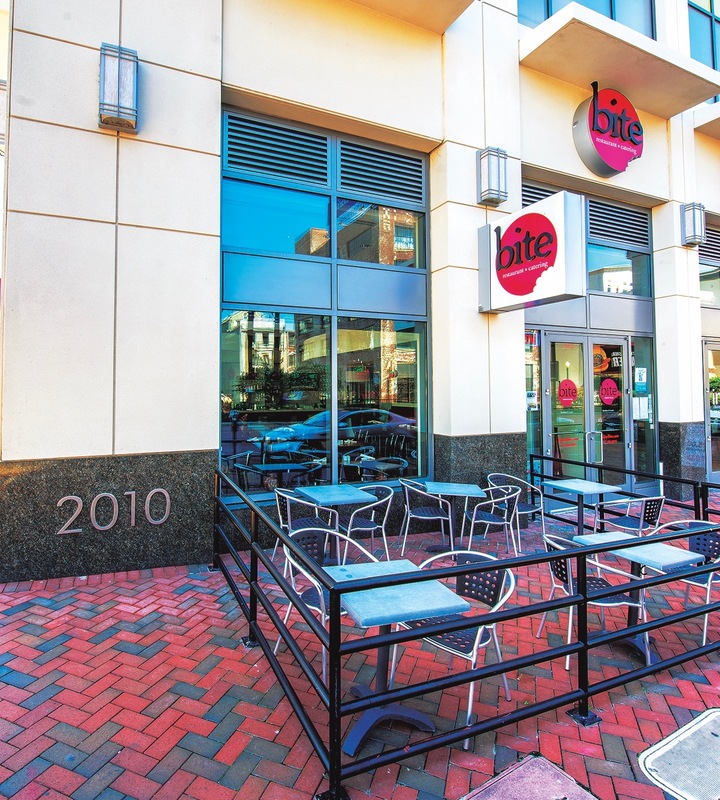 For many of the business people working in Downtown Norfolk, that place is Bite. Located on the corner of Charlotte Street and Monticello Avenue across from Scope, Bite is prominently situated and easily walkable from most Downtown businesses. Inside, the atmosphere is simple, modern and chic. Splashes of bright red bursting from booths and vases and woodgrain textures on the bar and wall corners add pops of personality to the cream walls and clean lines of the restaurant’s setting. On the far right wall hangs a multiple-canvas rendering of Downtown Norfolk. Indeed, it is a welcoming space to dine, with an open atmosphere and comfortable seating. We grab a spot in the corner before the lunch rush arrives and skim the menu, hoping for light sustenance on a humid summer day. 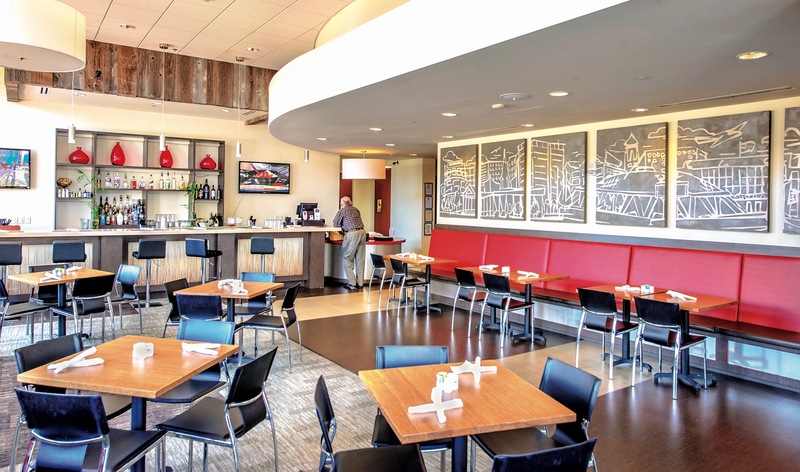 Bite offers a fantastic selection of the lunchtime S’s (that is, soup, salads and sandwiches), and their menu changes with the seasons, allowing them to serve lighter options in the summer and heavier foods in the winter. The restaurant doesn’t necessarily have one menu item they’re known for. “We just do fresh, clean food and do as much in-house as we can,” Mancoll says. Some of their year-round favorites, Mancoll suggests, are the Bite Greens salad (mixed greens, dried cranberries, goat cheese, candied walnuts and balsamic dressing) and the Cold Plate, featuring a scoop of chicken salad or tuna salad, house slaw, mixed greens, tomatoes, cucumber, carrots and a choice of dressing. “People kind of like the things they’re familiar with,” Mancoll says. Even so, we aim to try something new today: the shrimp wrap (plump, chilled shrimp, avocado, cabbage, tomato, cucumber and basil with chipotle aioli), served with Sriracha slaw, and the Asian chopped salad (sesame shrimp, shredded cabbage, romaine, carrots, cucumber, scallion, red pepper, cilantro and sesame vinaigrette). 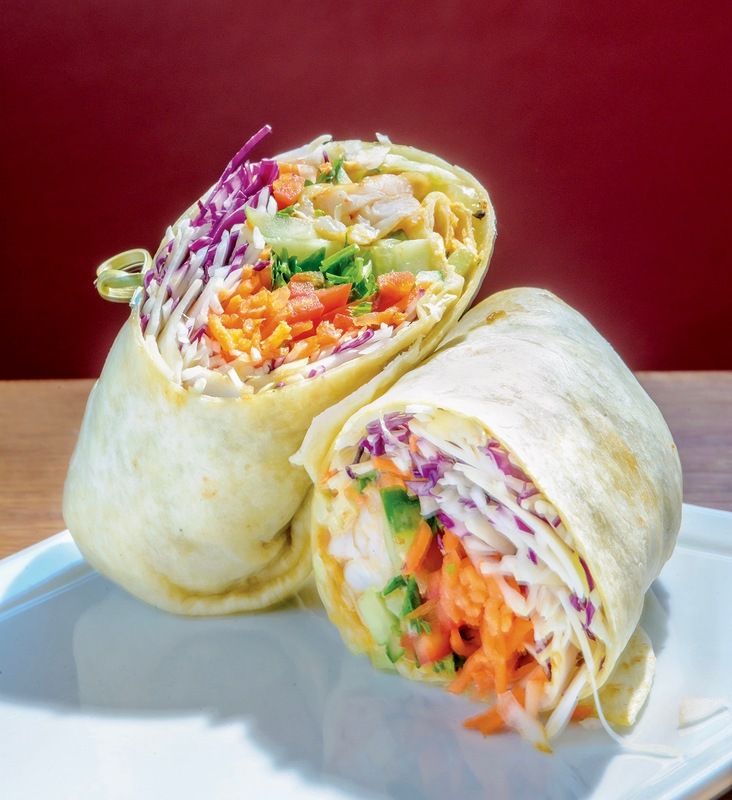 The wrap is fresh and filling, although we could have used a bit more of that chipotle aioli—that stuff is tasty—and the Sriracha slaw is crunchy and creamy with a nice kick at the end. 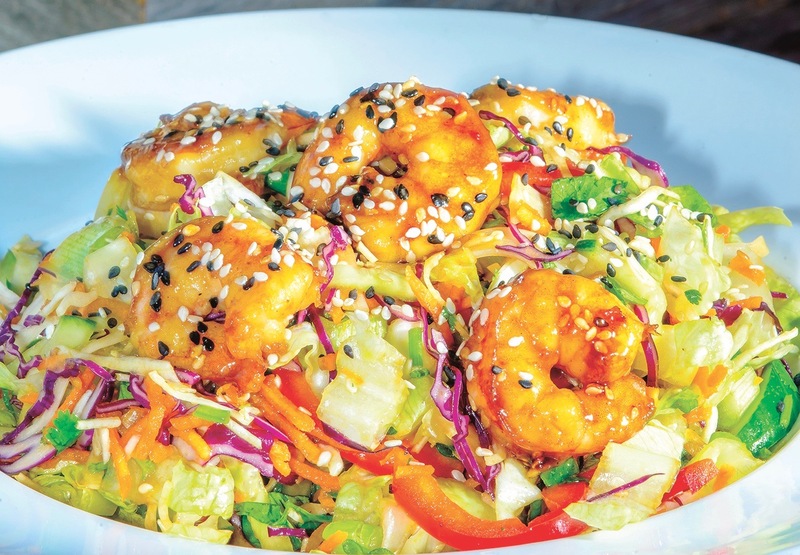 The Asian chopped salad is beautifully plated, bright and colorful with black and white sesame seeds sprinkled on top, with a fabulous sesame dressing spread evenly throughout the mix. Having consumed the majority of our portions and feeling quite satisfied, we could easily pass on dessert, but then we hear about a selection of cookies and quickly change our minds. The restaurant’s cookie offerings change often, but something tells us you can’t go wrong. 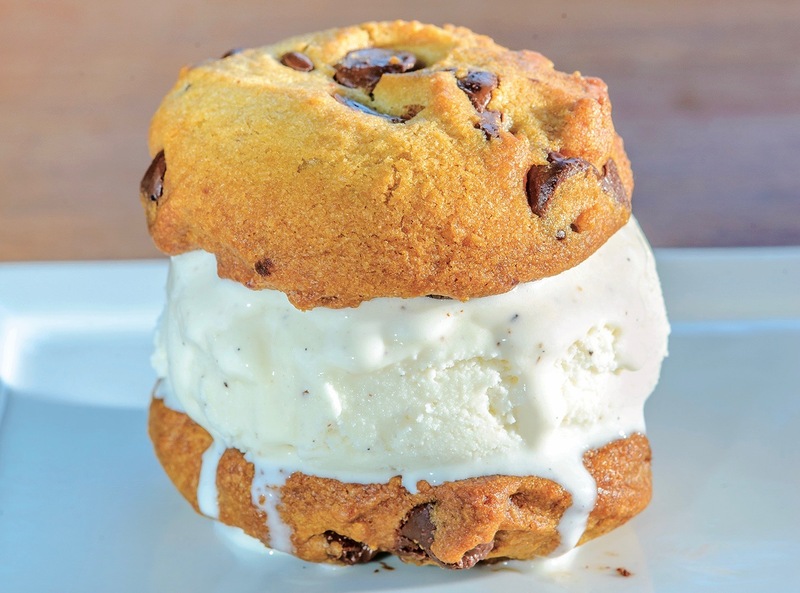 We order two chocolate chips and an oatmeal raisin and feel confident in our decision … that is, until the option of a cookie ice cream sandwich is mentioned. Oh, what’s one more bite? Bite also offers catering and hosts private functions for 10–110 people. Plus, a 1,200-space garage connected to the restaurant makes parking a breeze. Bite is located at 440 Monticello Ave., Norfolk. The restaurant’s regular breakfast/lunch hours are Monday–Friday 8 a.m.–2:30 p.m. Call 757-486-0035, or visit EnjoyBite.com for more info. Kara King’s Vintage Desk at Ironclad Distillery Co.
Posted by Ryan Miller in Biz Report, What's On Your Desk?